Digital transformation initiatives are changing the way modern businesses are run from the ground up. 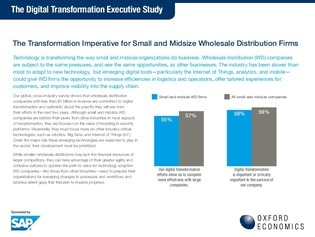 But while transformation is typically associated with larger, more resource-rich organizations, a recent global survey indicates that small and midsize companies might have even more to gain. Inside, take a peek at how small and midsize enterprises are addressing digital transformation – whether as a leg-up on competitors or as a means of survival. Based on cross-industry survey data, you’ll also get a glimpse at the technology investments fueling this movement.